Location of Morton in Tazewell County, Illinois. Morton is a village in Tazewell County, Illinois, United States, known for its pumpkins and annual Pumpkin Festival. The population was 16,267 at the 2010 census. Morton, the home of a Caterpillar Inc. distribution facility and a Libby's pumpkin cannery, is part of the Peoria, Illinois Metropolitan Statistical Area. Morton is also home to the corporate headquarters of Morton Buildings Inc. It holds its annual Morton Pumpkin Festival in the second week of September. Morton is the city east of East Peoria on I-74. It is claimed that 85 percent of the world's canned pumpkin is produced in Morton, earning it the designation "Pumpkin Capital of the World". Morton has garnered a variety of recognition related to quality of life in recent years. Morton High School is consistently ranked among the top schools in the state and country. Family Circle magazine ranked Morton one of its "10 best towns for families" in 2013. ✪ Travel Illinois - Morton Pumpkin Toss! According to the 2010 census, Morton has a total area of 12.994 square miles (33.65 km2), of which 12.95 square miles (33.54 km2) (or 99.66%) is land and 0.044 square miles (0.11 km2) (or 0.34%) is water. As of the census of 2010, there were 16,267 people, 6,622 households, and 4,507 families residing in the village. The population density was 1,251.9 people per square mile (481.8/km²). There were 6,973 housing units at an average density of 536.6 per square mile (199.7/km²). The racial makeup of the village was 96.3% White, 0.7% African American, 0.2% Native American, 1.3% Asian, <0.1% Pacific Islander, 0.6% from other races, and 1.0% from two or more races. Hispanic or Latino of any race were 1.7% of the population. There were 6,622 households out of which 28.6% had children under the age of 18 living with them, 58.4% were married couples living together, 7.0% had a female householder with no husband present, and 31.9% were non-families. 27.6% of all households were made up of individuals and 12.4% had someone living alone who was 65 years of age or older. The average household size was 2.41 and the average family size was 2.95. In the village, the population was spread out with 23.6% under the age of 18, 6.9% from 18 to 24, 23.8% from 25 to 44, 26.8% from 45 to 64, and 19.0% who were 65 years of age or older. The median age was 41.4 years. For every 100 females there were 92.8 males. For every 100 females age 18 and over, there were 90.0 males. The median income for a household in the village was $70,878, and the median income for a family was $87,800. Males had a median income of $54,055 versus $27,629 for females. The per capita income for the village was $34,632. About 3.3% of families and 4.9% of the population were below the poverty line, including 3.9% of those under age 18 and 5.4% of those age 65 or over. Morton's economy has been shaped by its proximity to both east/west and north/south interstates (I-74, I-474, I-155, I-55), central location between Chicago, St. Louis and Indianapolis, the presence of Caterpillar's logistics center, proximity to Caterpillar's corporate headquarters in Peoria, and the surrounding fertile farmland. Morton is a net importer of workforce due to the high concentration of major employers and has an unemployment rate (approximately 4%) below the regional, state and national averages. Major industry clusters include advanced manufacturing and logistics/distribution. Morton Community Unit School District 709 is the local public school district; it has one high school (Morton High School), one junior high school for grades seven and eight, and four primary schools for kindergarten through grade six. Private schools in the village are Blessed Sacrament and Bethel Lutheran, both private grade schools with preschool through eighth grade. 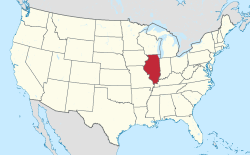 ^ "Morton, Illinois". Village Profile. Retrieved December 20, 2011.